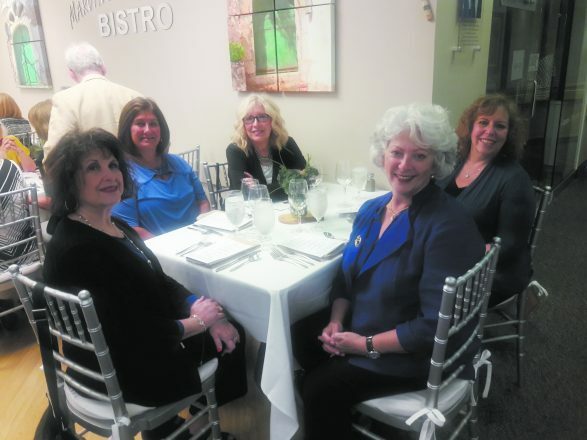 JSL’s Marvin’s Bistro hosts delicious evening. Gourmet dining for a cause. That was the thinking behind Friends of Jewish Senior Life’s decision to host pop-up dinners. The first on Aug. 2 was held at Marvin’s Bistro, an eatery inside the Edward I. & Freda Fleischman Residence in West Bloomfield. 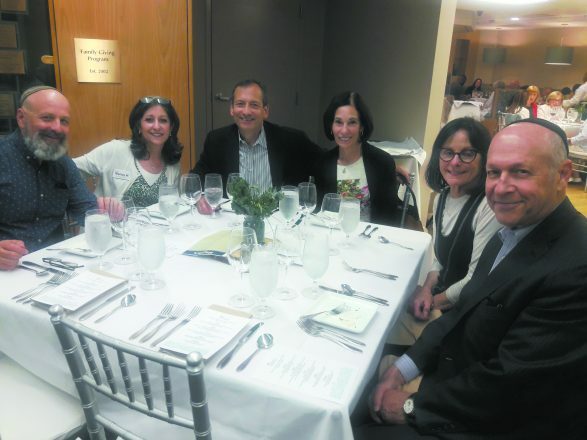 “What helped to make this dinner such a success is that those observing kashrut could come here and have a meal with their friend, because our dining service is under the supervision of the Council of Orthodox Rabbis,” said Friends’ director Leslie Katz. The “pop-up” (occasional) sit-down dinner represented an opportunity to showcase the talents of Ron Colasanti, director of dining services, and his team, as well as to raise awareness of the revitalized atmosphere at Fleischman Residence. Bob and Nancy Heinrich of Royal Oak; Andy and Helaine Zack, and Nancy and Brent Triest, of Huntington Woods. It was a different kind of event for Jewish Senior Life, whose chief executive officer is Nancy Heinrich. JSL, a constituent agency of the Jewish Federation, oversees several senior residences offering independent and assisted-living options on the Eugene & Marcia Applebaum Jewish Community Campus in West Bloomfield and A. Alfred Taubman Jewish Community Campus in Oak Park. JSL’s volunteer corps, Friends of Jewish Senior Life, serves to “enrich the daily lives of older adults in the Metro Detroit community through volunteering, fundraising and outreach,” Katz said. Pop-up diners had an opportunity to appreciate light and bright Marvin’s Bistro, an affordable dining spot beside the lovely Sharon’s Boutique. Both opened last year along with a renovated kitchen. A generous gift from the Fleischman, Robinson and Liebergott families made the projects possible. Fifty guests attending the sold-out evening were accommodated either in the 28-seat bistro or at tables placed beyond that space. For the price of $36 for an individual and $70 per couple, guests enjoyed “a five-course gourmet meal — kosher, of course — and a choice of red or white wine,” Katz said. First came presentation of an amuse-bouche, whitefish mousse inside a thinly rolled cucumber slice with lemon crema on the side. The French term means “mouth amusement.” The servers then brought out courses in the order printed on table cards. Karen Katz and Robin Pappas, both of West Bloomfield, Cheryl Weiss of Farmington Hills, Leslie Light of West Bloomfield and Karen Propis of Bloomfield Hills. The soup was New School Mushroom, a blend of exotic mushrooms with toasted farro and kale. Rainbow Beet and Carrot Salad combined fresh beets, tangerines, ruby red grapefruit, pistachios, microgreens and roasted pumpkin seeds, along with citrus vinaigrette and carrot ginger oil. Asian Thai halibut, featuring pan-seared and wild-caught halibut, included soy sauce, red curry, sesame seeds, coconut milk, red pepper, ginger and scallions, served with baby bok choy and basmati rice. The beef rib-eye course was grilled beef strip loin in mushroom demi-glace sauce, julienne vegetables and duchesse potatoes. Prior to dessert — Key Lime Tart in a graham cracker crust, with whipped cream — Katz announced winning numbers of three raffle prizes: Friends of Jewish Senior Life’s Friends Cook cookbook, $20 gift certificate to Marvin’s Bistro and two tickets to “Lives Well Lived,” the Friends’ fundraiser scheduled for Nov. 15 at the Maple Theater in Bloomfield Township. Invitations will be mailed in early October. 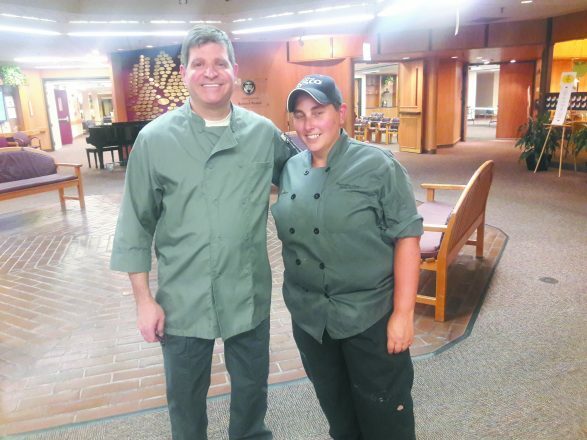 After dinner, a month in the making, the satisfied guests applauded the introduction of Colasanti and Executive Chef Kelly Ala of Fleischman and Hechtman Apartments. Colasanti developed the menu and provided coordination. Ala oversaw the cooking. She’s received numerous thank-you notes and phone calls “raving about how everything looked, from the table settings to the food presentation and, of course, about the dinner. “It was a beautiful meal,” Katz said. Friends of Jewish Senior Life presents another pop-up dinner on Oct. 18. The admission price hasn’t been announced. To avoid disappointment, immediate registration is advised by calling Leslie Katz at (248) 592-5062.